Italian wine plays a big role in Italian gastronomy. Having only 20 regions, regional wines distinguish themselves through the means of production, flavor profile, and climate that all represent the true colors of the region to which the wine belongs. The Italian peninsula extends form the cold Alps all the way down to the heart of the tropical Mediterranean sea where the sun shines bright and the weather is consistently hot. Therefore, wines in the South may taste different from wines in the North. In addition, the local flavor agents can showcase regional differences among other schools. 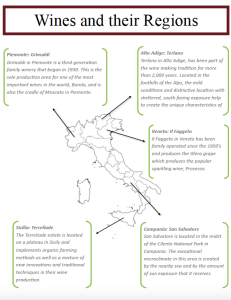 Below is a map of Italy with a description of five wine producers, each from a different region of Italy. We will taste wines from each of these producers on Saturday, May 14 at Sentieri’s Wine Intensive. To get a closer look at the map you can click on the photo below or follow this link. 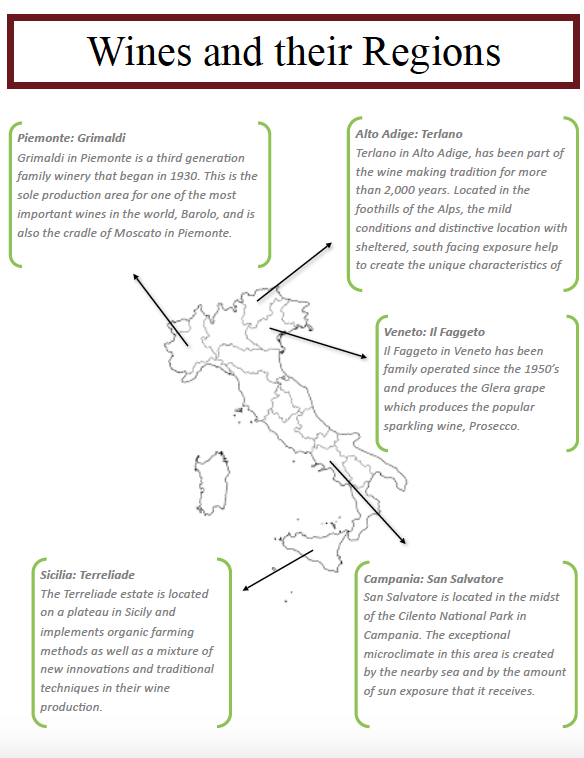 To grab a remaining spot and further explore these wine regions at the Sentieri Wine Intensive, you can sign up online.